"Hollywood is not known for its displays of modesty, and the world certainly does not look to film stars for lessons in financial restraint. But the opulent, gold-garnished menu concocted for guests at the Golden Globes awards ceremony in Beverly Hills has already prompted some observers to choke. Against a backdrop of intensifying food poverty across America, it may prove unwise to serve such principled acting nominees as George Clooney, Meryl Streep and Michael Fassbender a dessert that is literally as difficult to acquire as gold dust. The pudding, decorated with real gold, is described as "a chocolate delice, almond crunch terrine, garnished with acacia honey, caramel and fresh berries" and sprinkled with edible gold flakes at $135 a gram. The dish was devised over six months by pastry chef Thomas Henzi at the Beverly Hilton hotel and is being prepared by 40 chefs and 110 kitchen staff. --from article: "Golden Globe celebrities enjoy meal of real gold as poverty tightens grip on US" by Vanessa Thorpe for The Guardian. This article kind of cracks me up, it's a typical type of article that you read and I agree with the initial value that says people are starving and we should take care of them. But if the Hollywood Foreign Press decided to serve a less opulent desert, it's not like the savings would go to Americans struggling with feeding their families. Plus, I know I have a hard time getting to excited about any desert made with pudding - so maybe they thought gold dusted tiramus was too much, so the dust the pudding. Actually, I think the discussion wouldn't happen if the Hollywood Foreign Press chose another exotic ingredient for their meal or desert, but the word "gold" creates a stir. But of course, there a reason why they would chose gold as an ingredient for the Golden Globe awards. And I bet that Tiramisu with lady fingers infused with Kopi Luwak coffee and a La Madeline au Truffle by Knipshildt Chocolatier on top (at $250 a truffle) would be more expensive. In fact, that sound delicious. 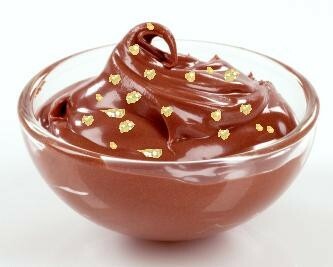 Much better than gold dusted pudding! Actually, I'm sure it taste fine, and I'm glad there putting honey and berries on the pudding, not caviar and gold dust - now that would be excessive. I know that the money would not have necessarily gone to people who don't have anything to eat. However, I understand the view of not overdoing things when it comes to functions or events that the public is looking at, that honor people whose earning power depends in part on the support of that public.